Speeds up your site by optimizing code. Is there a better alternative to HTML-Optimizer Pro? Is HTML-Optimizer Pro really the best app in HTML category? Will HTML-Optimizer Pro work good on macOS 10.13.4? Note: HTML-Optimizer Pro is no longer actively developed. The app is still available for download from the listing, but no further development will occur. HTML-Optimizer Pro speeds up your site by optimizing both HTML and script code of your Web pages and optimizing your JPEG and PNG images. It helps you keep organized by creating a duplicate site folder for the optimized files. An added benefit is that it leaves your original files untouched. You should use your original Web folder for editing and use the duplicate Web folder for uploading. Changed the Tonbrand Software address to http://www.tonbrand.dse.nl. This update is a must. HTML-Optimizer Pro features Smart Handling, supports XML, and can handle Web pages with any text encoding. Moreover, it can check your Web pages for dangling tags, missing attributes and broken links. 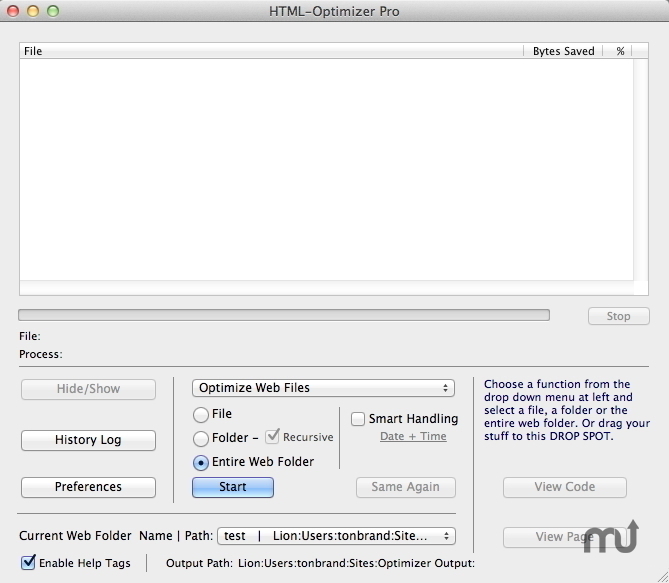 HTML-Optimizer Pro offers many options to customize its operation to your special needs. Drag-and-drop is supported.